JD, our Portfolio Analyst, is responsible for the supervision and analysis of our discretionary investment accounts. He specializes in analyzing and recommending outsourced (Third Party) investment management solutions and selecting Corporate Retirement Plan investment lineups. 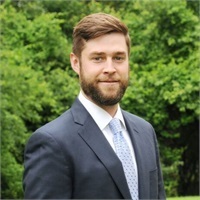 JD joined SFP Wealth in 2012 as a case analyst and was responsible for analysis of insurance, investments, financial planning and retirement plans. In 2013, he transitioned to the role of Investment and Planning Analyst where he refined his investment and planning skills. After receiving his Chartered Financial Analyst (CFA) designation, he moved to his current role as Portfolio Analyst. JD received a bachelor of Science in Accounting from Elon University. He holds his FINRA Series 7 and 66 licenses, is a registered Investment Advisor Representative and a Chartered Financial Analyst (CFA). In his free time, JD enjoys spending time with his wife and beagle. He also enjoys golfing, and if he had his way, you would have to meet him in the White Mountains of NH to see him on the weekends.